The first barn reclaimed for BWT rested on a farm outside of Bennington, NE. Linda and Larry have lived on the property since the 1960s, and the land has been in Larry’s family since 1878. His ancestors who bought the land were German immigrants and were among the first in the Midwest to create iris and peony hybrids using European and American seeds. The barn was built around 1913 and originally served as a dairy barn, housing the cows who needed milking every morning. Later, after the farm’s agricultural focus shifted away from dairy, the barn served as a playground for Linda and Larry’s children. 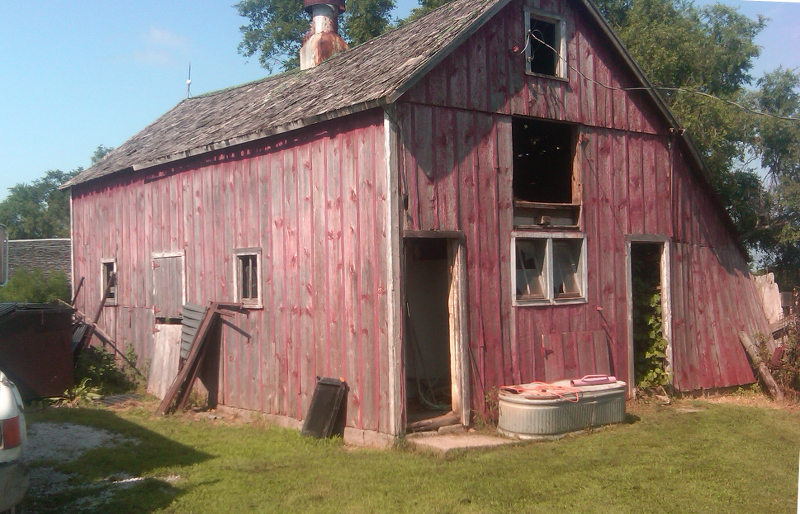 They spent hours on weekends and summer months “playing house” with their friends and exploring the old hay loft. Linda recalls that there were no broken legs but “lots of broken windows.” In later years, the barn became the kids’ own hangout space, filled with old couches and strung with Christmas lights. Today, the barn enters yet another life as the memories within its walls are now transferred to you and your tray. Did you know? Some of the trays that were built from this wood have silver paint; this wasn’t painted by Dan for aesthetics. Back in the early 20th century, the Department of Agriculture required that milking areas had to be painted, so the silver paint is actually decades-old and original to the barn.